Today’s page is by the indomitable Ryan Estrada! 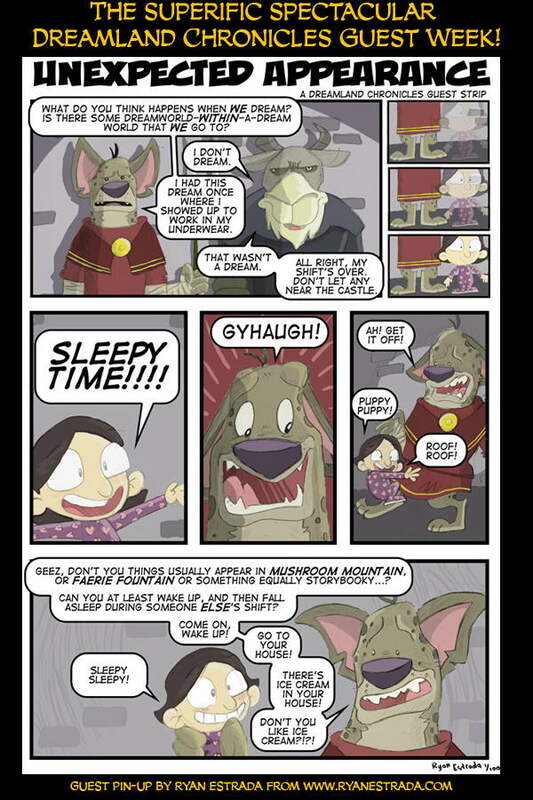 Aside from this wonderful strip for Dreamland…from what I’m told…Ryan has over 100 guest strips out there today. Yes…TODAY. Thanks Ryan. I love this page. So funny…and so dead on to how the world works. Check out Ryan’s website and look for more guest pages from him throughout the webcomic community. I’ve been making my Webcomic rounds, and this is the 5th Estrada Guest Comic I’ve run across so far. I guess that means I read 5% of the same webcomics that he does. hehehehe! I’m thinking that kid’s parents don’t read her the ‘normal’ bedtime stories. Is Ryan going to continue this? I would love to see what happens! Momoko, here’s one I found. I only read like 3 webcomics a day, and 2 out of 3 were Estrada guest strips. when the story goes further? HAHAHAHAHAHAHAHA! Hilarious! Gonna follow the link now! he’s afraid of sleepy time?! Heh. What DO you do in a situation like this? …Glad it wasn’t my shift. Hey, What do you think Dream Land would look like if Jim Henson was around to do a movie on it?